On March 9th of 2014, millions of HBO subscribers huddled around their device of choice and tried to watch the season finale of the smash hit True Detective. The service was swamped under the wash of demand and fell over. The backlash was swift and merciless and people had to turn to traditional cable to get their fix. This was, understandably, an embarrassment for what many consider to be the flagship content producer on cable. Not one month later and it happened again. After the Game of Thrones premiere also caused the service to buckle, the company was forced to re-evaluate how it would stream tentpole events to millions of concurrent users. Netflix, by comparison, has over 50 million customers and almost never goes down — even when it dumps full seasons of hot shows like Orange Is The New Black and House of Cards. It’s not an exact comparison, but it’s close enough in consumer eyes to give HBO a black eye of sorts. So, HBO had to make a choice, either find a way to massively scale its streaming infrastructure or find someone else who could do it for them. They went outside, to the entity quickly becoming a go-to streaming problem solver for the media world: Major League Baseball. More specifically, MLB Advanced Media, a limited partnership of the club owners of Major League Baseball. A technical arm of the league’s media efforts, it was founded in 2000 and handles the MLB’s website, all of its game streaming efforts and its various mobile apps like At Bat. In recent years, it’s also becoming the streaming delivery service that high-profile media companies are turning to in order to deliver mind-breaking amounts of video data reliably. It’s been so successful that there have already been talks about it spinning out and becoming its own company with either minority investors or as a solo job. MLBAM currently has around 850 employees, up from 600 in 2012. It streamed 26 billion minutes of video in 2014 and shipped 390 petabytes to consumers from its infrastructure, which includes six data centers across the US. In 2014 alone, it streamed 400k hours of live content — in 2009 that number was only 18k hours. MLBAM had around $800M in revenue in 2014 and is projected to hit $1B in 2016. That’s in addition to handling business as usual for CBS Sports, ESPN, Glenn Beck and a host of other partners that it works with regularly. Early numbers for the first 3 days of March Madness put MLBAM at 47 million live streams, up 7% from last year and a new record. It’s a crucible, for sure, and if MLBAM can come out the other side without any major issues, it could court a whole lot more business. MLBAM CEO Bob Bowman has been with the media arm since its founding in 2000. Late last year, in preparation for Rob Manfred becoming the MLB’s new Commissioner, Bowman was made MLB’s President, Business & Media. I spoke to Bowman about MLBAM’s busy month, the crowded streaming landscape and what Apple might need to do in order to plant a stake. Here’s a lightly edited transcript of our chat. Matthew Panzarino : What’s your next 30 days going to be like? Is this going to be the biggest section of streaming video you’ve done so far? Bob Bowman: I think the numbers will be huge, simply because of the properties that you mentioned, not the least of which is baseball. I think what’s different this time through is Sony [PlayStation] View, which has been in the works now for a time now. That’s a limited rollout in three cities, but it’s an important one. It’s a brand-new way to look at pay TV, and along with SlingTV, you continue to be focused on what pay TV looks like in the months and years ahead. That’s not trivial to us, even though it may not be the kinds of numbers that baseball or March Madness might do. The HBO one is, again, the numbers will probably be pretty big, but this unique and different, too. That’s one of the major media brands in the world, and that’s doing a launch with one of their best content properties ever. I guess what I’m saying is, this has to be 9s all the way across — 99.999, in terms of reliability, customizability, beauty and all of those other things in order to be successful with the entire world examining it. Not just to HBO customers and people who are buying it, and not just Richard [Plepler, HBO CEO] and his team, but every other network. Because when HBO moves in this direction, every other network is going to look at it. MP: HBO is such a calling card. BB: We’ve said publicly, as you know, that every content creator has to be looking at a way to reach its customers and fans in the years ahead, and they always have. There’s alternative ways to do that, now. For some, over the top makes more sense. For others, it may be a different way to go, such as the SlingTV model — ESPN is doing that. They’ve talked about doing over the top, but they haven’t done it yet. They’re doing SlingTV, which for 20 bucks a month, is pretty close to over the top in terms of price. But they are not all the way there, doing it themselves, à la carte, in terms of what they might charge, but that’s a big step. I think them being a part of SlingTV and HBO doing this stand alone over the top at $14.99, I think those two are the most significant things that people are looking at in terms of what does paid TV, customer driven, customer based TV delivery or video content delivery look like in the months ahead? Everyone is going to be looking at the HBO launch. It won’t just be the customers, or who they are hearing from, it will be a lot of other folks, too. Again, it’s one of our largest undertakings of all time, but it has ramifications far beyond the number of customers that enroll that night, and things like that. Obviously for Richard, we will succeed, and his entire team who have been great, and for their legions of fans. But we also know other networks are going to be watching, too. MP: Philosophically, we’ve always thought streaming, especially in the last few years, we thought of streaming as on-demand. Now, everybody is gearing up for this live push. Why do you think this tipping point has been reached? BB: I think a lot of things. First of all, as you know, 12 years ago, we started streaming live baseball. We’ve been over the top with live content for 12 years. 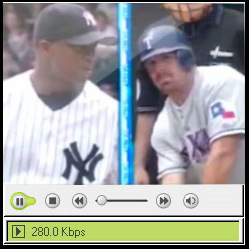 MLB.tv was the first over the top service. It was so over the top, we didn’t call it over the top. We just called it live streaming back then, we didn’t have anything clever like OTT. We just went with live streaming. MP: Yeah, I remember the postage-stamp-sized player. BB: I think it was a little bit bigger than that, but I get your point. It’s come a long way, that’s for sure. Live streaming has been around forever, and I think the other leagues are the next to join in over the next three or four years. But I think what changed is everything, from somebody’s point of view. Just the proliferation and reliance upon new devices. For us, a lot of our games are streamed on desktops. If that was still the way that everybody was just living on a desktop, I’m not sure there would be this rush to do this. I think over time, people are going to view this stuff on mobile devices, or laptop devices and things like that, and I think that invariably means, you’re not at home, or you’re not in your living room. We say your office is wherever you are sitting today. You don’t have an office anymore, it’s wherever you sit — that’s your office. The same is true to your living room, wherever you sit down, that is your living room now. I think we can credit all the device manufacturers, Apple is at the top of the list, but so is Samsung. You have to add Samsung to that list for all the great devices they built, and I think you can also credit technology. It’s gotten to the point where live streaming is just really good. I see above, the postage stamp player. The players are good, it’s true hi def, it’s generally very reliable. There are still a lot of handoffs, and nothing’s perfect, but it’s gotten to be very reliable. I think instead of being an effort to do, it’s almost effortless to do it. I would say finally, just attitudinally, I think people under the age of 25, because they have been trained by YouTube and Netflix, they expect content to be on their device. MP: People expect to be able to tap into it, and not have to go to a central point that services them. BB: Right, or have another contract somewhere else. MP: And so along those lines, live is obviously the way to go. BB: All that said, you have to sit back and applaud Time Warner and Richard for making this decision. It’s not going to be easy. I’m sure he’s heard from a lot of his colleagues and partners, and I’m sure he will continue to. I know we have, for the last 15 years. And so, he’s doing the right thing, he’s putting his customers first. We like to think that whenever a media company puts its customers first, good things will happen. I think that’s what Richard’s done, and while a lot haven’t done it yet, Richard is in that way a trailblazer. I think he’s doing the right thing, and I think it takes a certain amount of confidence in your content to do what he’s doing. I think increasingly, people are going to have that confidence. MP: In that same vein, you’ve got obviously this huge appetite for on-demand, catch up, binge viewing material. Do you think there’s still a very healthy appetite for live streaming broadcasts and cable content? BB: I think it’s going to vary — depends upon the content. Will there be a lot of interest in watching the first installment of Game of Thrones on April 12th? You bet. Does that mean there won’t be binge viewing? No, there will still be binge viewing, but people, I think there are certain episodes that you can wait and see later, and you want to watch on time. I think social media has affected that a little bit, because you want to be able to talk about, did you see this happen? We have a feature in our player where you can hide the score if you’re coming back to watch the game later on. You can hide the square, you can turn on the TV, you can watch the game without knowing the outcome, but increasingly, people know outcomes. It’s not even news anymore to know the score of the game. Similarly, to know what happened in the first episode of Game of Thrones, there will be 75,000 summaries out there. Even though they could be delayed and watch later, and even though they probably will be again, there’s certain episodes that people want to watch the first time they are available to the public. I think it’s a little of both, and maybe not episode seven of some sitcom or sit-drama that’s been on for 10 years. But certainly, something like Game of Thrones is an example where a lot of people are going to want to watch the first installment on April 12th. MP: Let’s switch gears a little bit and talk about BAM as a business. You folks opened up the San Francisco office last year, right? How is that working out? Have you been able to tap into that talent pool? BB: It’s working out great, for lots of reasons. One is, it’s a great location near ATT Park. Two, some great people here moved out there who would rather work for Bam in San Francisco, and so, the talent pool that we have that wants to move to San Francisco, we can keep and get in San Francisco. Three, as you suggested, it’s a lot easier to recruit when you have an office in San Francisco, for somebody who lives out there. I don’t need to tell you how hot San Francisco is right now, as a location, but it is white hot. It’s great people, really talented. They understand, they are closer to a lot of our clients, which also reduces travel, and it’s worked out exceedingly well. So much so that we continue to take space there. MP: How big is that staff now? BB: The number of people out there is roughly 40. I wouldn’t be a bit surprised if by the time we’re rolling out HBO and maybe some other networks that are coming on, there will be a hundred. …And that number doesn’t really decline much. As we always like to remind everybody, this is one instance where day two is in some ways just as tough as day one. Because people use the service, they’re using it a lot differently, we find out about usage patterns, but it has to work just as well on day two as it does on day one. This is not a three day event. It’s a 365 day a year event. Talking about WWE, we ran the network with a lot of on demand viewing. Somebody discovers it, they dig deep into the stuff they are getting. But obviously, with Wrestlemania 31 comes on at the end of this month, we are going to get a massive spike. Every media company and every form of media, they all have their tent poles. MP: You’ve been doing the MLB business, and that’s where you started, and you’ve also been courting these outside players. What’s the balance now? BB: There’s really two things here. MLB.com, the one that manages the rights for the teams and all the other things, that right now is probably 85 percent of our business. That will fall. I don’t think the numbers will ever reverse themselves, but I think that’s one of the reasons where the Commissioner mentioned in some interview that they were contemplating strategic investors. I think the question is, how big can Bamtech be? How best to grow it, what’s the smartest way to grow it? Does it grow with strategic investors rather than just being wholly housed here? We’ve clearly changed how we run Bamtech internally. It used to be allocated people, 8, 9, 10 years ago, and now, it’s dedicated people. It’s a full-time job to work over here. Obviously, you bring in a property like HBO, or WWE or March Madness, you get people that raise their hand and say, “That’s what I want to work on,” because it’s fun and exciting. But I think the notion, the business has changed, and where we could never separate the business before, that’s the way we ultimately go, Matthew. It would be something we could do now, because we have so many dedicated people in this third-party business. MP: There has been some talk of spinning MLBAM out into its own business. Has there been any progress in that spinoff area, anything you can talk about? BB: Mainly internal. Get numbers straight, get everything orderly and make sure when I say dedicated, it can’t be somewhere within a million dollars. You should know what the person is, you should know exactly what you’re talking about. And so, we are just finalizing that. We’ve had a lot of people obviously call, and express interest and other things. MP: If we could…talk about hypotheticals for a second, Apple is rumored to start their own service along the lines of Sling and View. Who knows who else they have on board, rumors are everybody but NBC. Do you think that Apple is equipped to do this…or would they need to come to somebody like BAM? BB: I have no idea. We’d be honored to be part of anything, really. Apple’s been our partner from day one, and while I don’t know Tim Cook, we obviously know Eddy and Phil. What people forget is how long they’ve been together, and how well they’ve been running the company. I think everybody would do a lot of things to be partners with Apple, but it’s hard to imagine there’s anything technologically we could bring to Apple. But you never know, Apple is — while they have a lot of software to manage this stuff, and obviously, they have outstanding eye on hardware design, it’s a different business. It might be fun for them to see how their in-app purchase actually works. It’s hard to imagine that they are going to need an outside service to do their stuff, but you never know. MP: What plans do you have for an At Bat app on the Apple Watch? BB: We obviously built a whole interface, when it launches in April and people sync their phones, they’re going to get, obviously, the interface is different. Every piece of hardware has to look different. And so, we built it already, teased at the announcement a couple months ago, and wait and see. Hopefully, it looks cool and neat and — the watch itself, there’s ways to dig deeper. When you move it, you might just get an update, but when you punch it a couple times, it’ll dig a little deeper. Like we do with every device they’ve given us, starting way back when the first iPhone and all the iterations; the first iPad and all the iterations; and the watch and all of its ultimate iterations — we built the best thing that we thought we could from what that piece of hardware could take. Hopefully, you will like it when you see it. MP: To wrap it up here, if you had to pick a competitor to what you guys are doing in streaming that was probably closest on your heels, who would it be? BB: I think the biggest competitors that we have are inertia — do nothing — or ‘self done’. You know, done by [a company itself], which I think is — in the long run, unless you’re a technology company — not the best way to go, because capex never falls. While things get cheaper, other things come along. Unless you are a technology company, the game is played above the rim, to use an NCAA quote. MP: That’s on-message, so you should keep that one around. Bob: I’m just clever that way, I can’t help it.